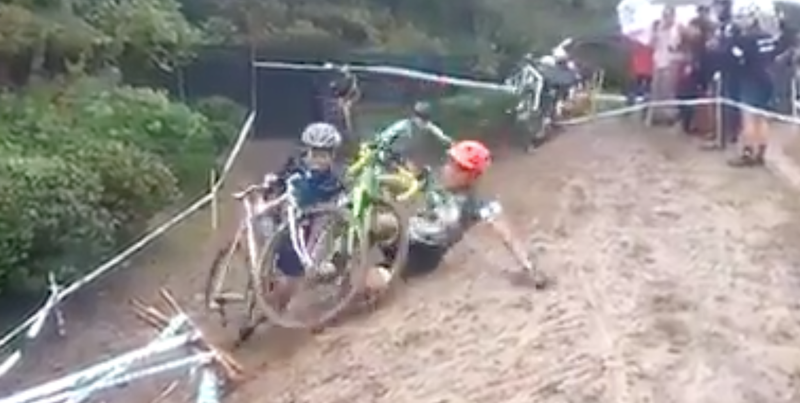 Cyclocross is a great, silly sport primarily practiced by lowland Europeans like the Belgians and the Dutch. Designed as a seasonal alternative to road cycling, it is a great excuse for fans to eat frites and hand up beers to the riders. It’s like a combination between cycling and mud wrestling, and because of the varied terrain, it produces the best crashes in cycling. Take, for example, our friends here. The slapstick scramble to claw up out of the mud pit is great, but the incessant giggling is even better.